We traversed the earth - from the majestic palaces of Indian maharajas to the modest, centuries-old practices of French horticulturalists - and created a mythical mist inspired by the power of the humble rose. 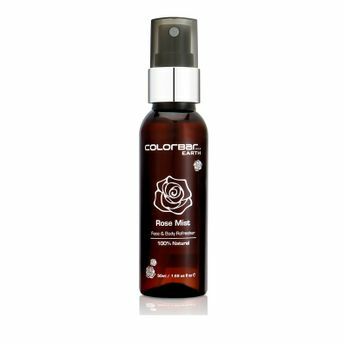 Colorbar Earth Rose Mist is created by a special steam distillation of crushed rose petals. This beautiful, rosy water is then infused with grapefruit extracts from France, and an intensely nourishing mix of aloe vera, green tea, mulberry fruit, lavender, and liquorice. It lightly hydrates and balances the pH levels of your skin - so you feel refreshed, re-energized, and rejuvenated with every spray. About the Brand: Founded in 2004, Colorbar is among the leading brands of color cosmetics in India and is extremely popular among the urban women. The brand sources its inspiration from the millennium woman who believes in expressing her various moods and desires through a variety of colors she adorns. Colorbar promises to provide its customers the trendy makeup which is innovative, classy and world class, covering a wide range of colors with a belief of redefining the chic and sensual woman of today. Explore the entire range of Toners & Mists available on Nykaa. Shop more Colorbar products here.You can browse through the complete world of Colorbar Toners & Mists .